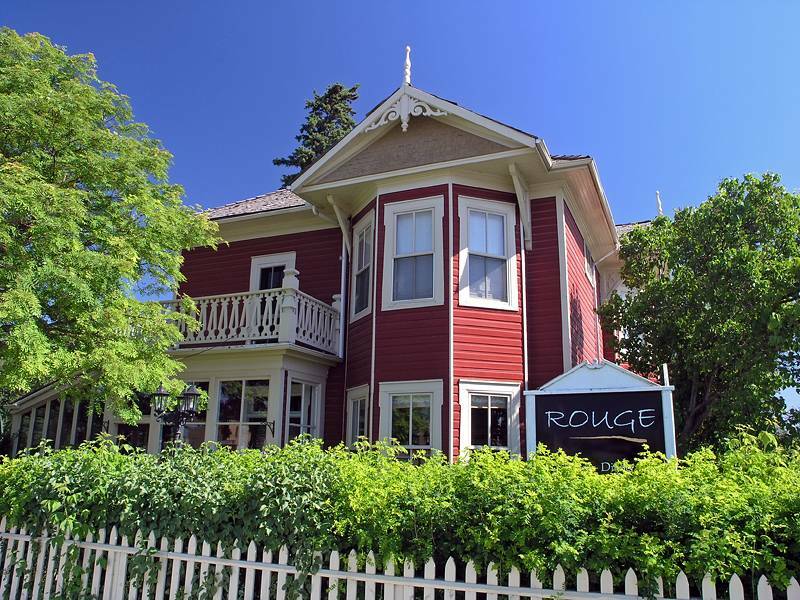 Located in a historic home, Rouge Restaurant serves upscale French cuisine in a quiet, almost rural setting. The menu emphasizes contemporary French cuisine zestily translated to western Canada. For appetizers, choose warmed crab and artichoke cocktail or shortbreads with mint cucumber salad. Rack of lamb is served with gooseberry chutney; roast chicken breast is served with morel mushroom cream; and apples, leeks, and pistachios adorn blue-cheese ravioli. Seasonally, the outdoor garden and patio are available for dining and private functions. The garden area covers 6 city lots and is adorned with enormous trees, flowers, and native shrubs. It truly is a retreat from the every day. Hi Gary. What a terrific angle to capture this fine old house. The greenery, fence and gradient blue sky provide an exciting little inner frame. Good lines and contrasts. Nice work. All my best, Michael. I'll have the rack of lamb please. I just finished a terrific meal and you've made me hungry again! Very nice photo of a really lovely building. Nice image Gary. Red against the blue sky with the green trees is great. And the menu sound wonderful.